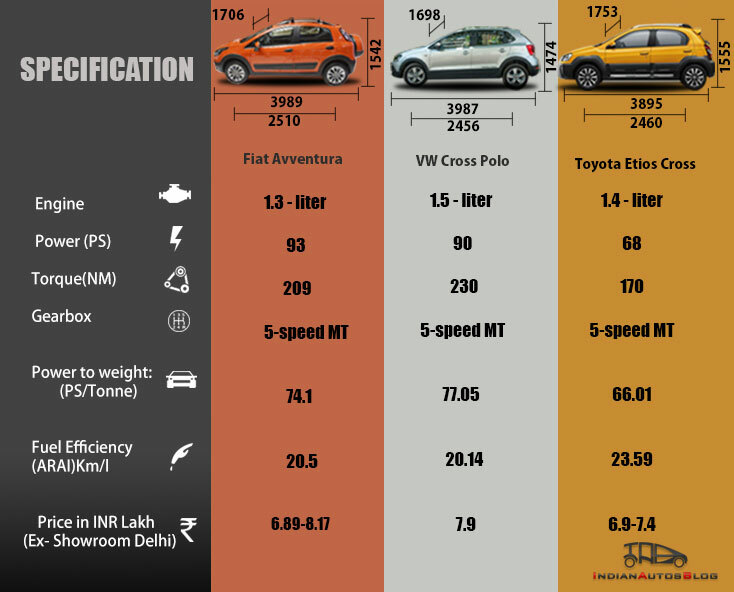 Here is a spec-sheet comparison of the Fiat Avventura against its rivals, the VW Cross Polo and the Toyota Etios Cross. In terms of dimensions, the Avventura is clearly the longest at 3,989 mm followed by the Cross Polo at 3,987 mm. In the height and width department, the Etios Cross clearly beats the Avventura, and the Cross Polo is the slimmest and shortest in its segment. Thanks to its length, the Avventura's wheelbase is the longest in its class, and the Toyota and the VW are nearly evenly matched at 2,460 mm and 2,456 mm respectively. The Cross Polo has the largest boot at 294 liters, followed by the Avventura's 280 liters, and the Etios's 251 liters. The Cross Polo was relaunched on the market in August with a new engine and improved looks. Coming to the engines, we have compared the diesel variants of all cars. The 1.3-liter engine in the Fiat makes it the most powerful on paper at 93 PS, and the higher displacement 1.5-liter in the VW makes 90 PS. The Toyota, despite its 1.4-liter engine, makes the least amount of power and torque at 68 PS and 170 Nm respectively. The Cross Polo is the torque-iest of the lot at 230 Nm. It also has the best power to weight ratio in its segment. The Etios Cross sells about 1,500 units a month, surpassing expectations, the company's MD said in a recent interaction. The detuned nature of the Toyota's engine helps it perform better in the efficiency department, where it achieves a class-leading 23.59 km/l. The Cross Polo and Avventura average 20.14 km/l and 20.5 km/l respectively. 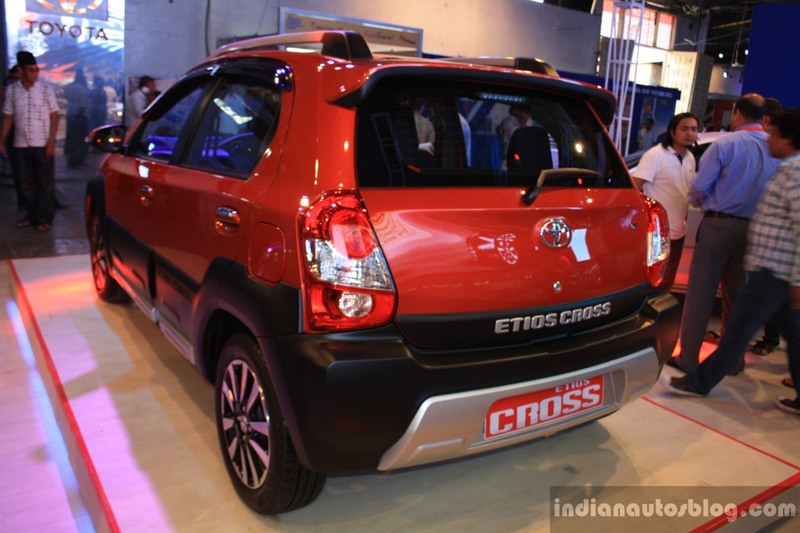 In terms or price, the Avventura has the least starting price, undercutting the Etios Cross by INR 1,000. 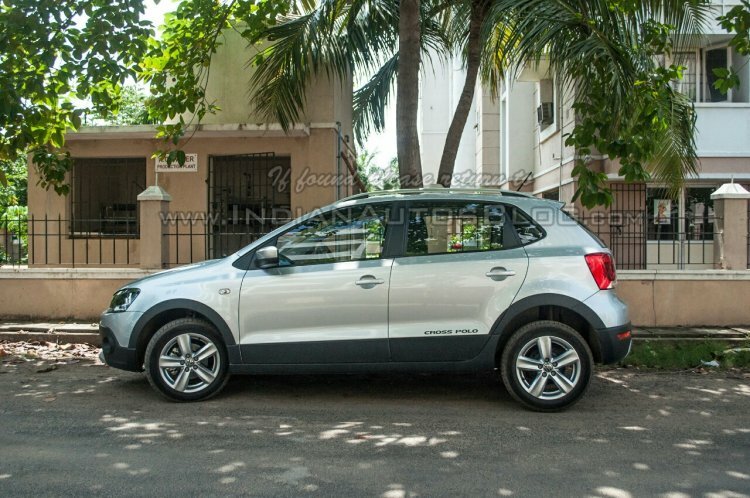 However, the top-end Emotion trim is a full INR 27,000 pricier than the Cross Polo and INR 77,000 more expensive than the Etios Cross.